“Web of Languages” introduces the basic to early intermediate librarian, library staff member, student, web developer or administrator to usability, as well as developing applications with AJAX and jQuery. Sarah Houghton will provide perspective on web usability with an overview of web development techniques for library websites and web applications; Derek Christiansen will define AJAX and present a number of SJSU applications of AJAX; and Cary Gordon will discuss the uses of jQuery in web development. The purpose of the program is to introduce these technologies and techniques so that librarians and library staff can better understand and visualize what is possible using these web development techniques. Contact Suzanna Conrad (suzanna@terabytelibrarian.com) or Stephanie Roach (sroach@jfku.edu). LIS Lady, Stephanie Roach, currently serves as the Event Coordinator for the CLA’s Technical Services Interest Group. My dramaturgical project at Chabot College’s Department of Theater Arts is keeping me quite busy. Since the beginning of the project, I’ve observed auditions, met the company, attended a few rehearsals, begun research, and am putting together a “look book” for the use of the director, cast and crew. What a wonderful opportunity to bring together my love of theater and literature with my professional ambitions as a researcher/librarian. Further, I get to put it all together in a blog format, for which I’m creating a taxonomy that keeps it organized and easily searchable in ways that relate specifically to the production of the play, and hopefully make it more useful and accessible as a company resource. One of my goals with this project is to bring the information I find to the students involved in the production of John Steinbeck’s The Grapes of Wrath where they play out their virtual lives and in formats they will use online. Most communication outside of the rehearsal process is via Facebook. In addition to posting information on the Grapes of Wrath blog, information goes up on Twitter (#ChabotTheater) and of course, on the company Facebook group page. YouTube and other video sources have also proved valuable. Fortunately, many wonderful images are available from the Library of Congress, as part of the Farm Security Administration-Office of War Information (FSA-OWI) images found in the American Memory Collection: America from the Great Depression to WWII: Black and White Photographs from the FSA-OWI 1935-1945. This is an excellent resource that is primarily in the public domain because most of the images are government documents photographed by government employees. 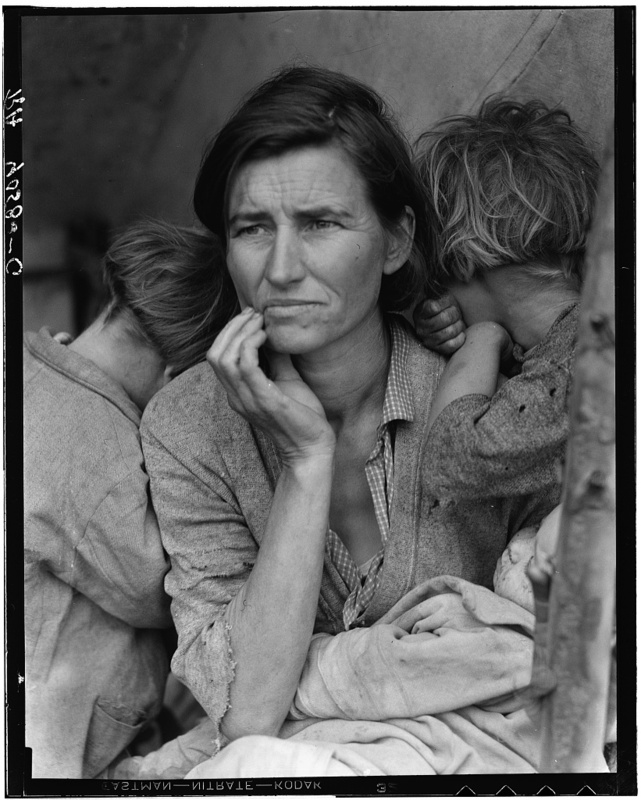 And of course, so many of the images from this collection have become iconic, such as the image below by Dorothea Lange. Apologies for the delay in posting! This last semester of grad school is keeping me extra busy, and this last week has been a doozy. I’m back on track now, though, hoping to post once a week again. 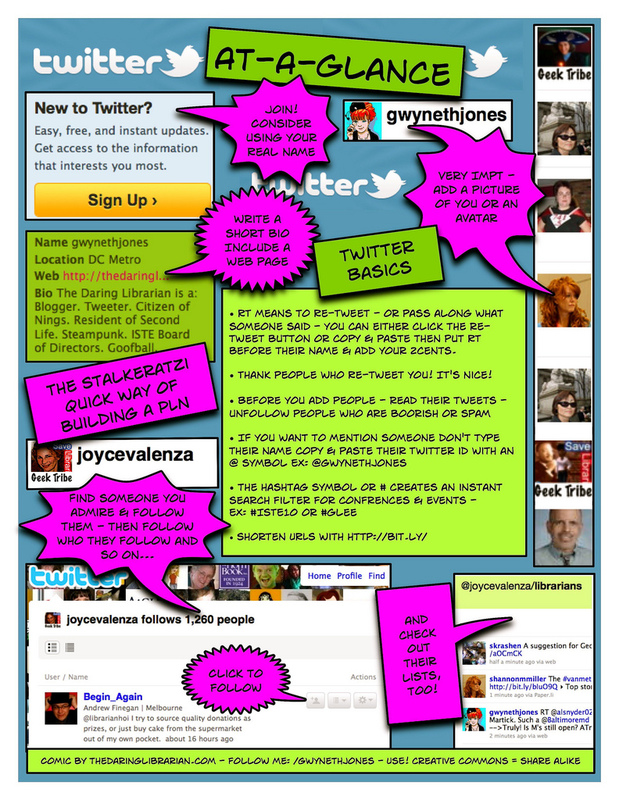 Today on Twitter I found this lovely “Twitter At a Glance” as retweeted by @ShannonMMiller via @GwynethJones aka the Daring Librarian. Anyhow, it is a great “how to” twitter guide in comic form, so I’m sharing it here. Image courtesy of The Daring Librarian on Flickr, posted under a Creative Commons License. An interesting question for me regarding the audience of the movie itself and of course that of the parodies by default, is if there is a digital divide built in, and what this might mean. Yesterday, I actually met a charming twenty-something gal, who is not on Facebook, and I was a bit shocked. Tattooed and fashionable, I felt sure she would be totally plugged in. Perhaps she is a neo-luddite. Or perhaps she just doesn’t own a computer. Who knows, but I seriously doubt this movie or the delightful parodies of the trailer will resonate with her. Either way, the divide between the haves and have nots is certainly apparent when thinking about the potential audience of The Social Network. *Thanks to GeekSugar for showcasing the Twitter and YouTube parodies of The Social Network trailer on the GeekSugar blog. Get LIS Lady on the go!